I'm a huge dog lover. If you follow me on Instagram or Twitter you've probably met my dog, Norman. 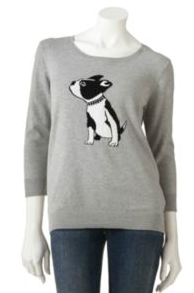 So it's easy for me to love the graphic dog trend that we're seeing on sweaters and tops lately. You can find them at any price point so let's look at a range. 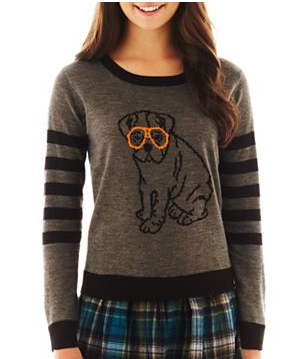 An instant 'awwww' should have been your reaction to this sweater. And then you notice the details like the varsity stripes, contrast hem lines. And then, the price. Look at this guy! I would add a contrasting patterned button down to this and add a black pencil skirt for work. 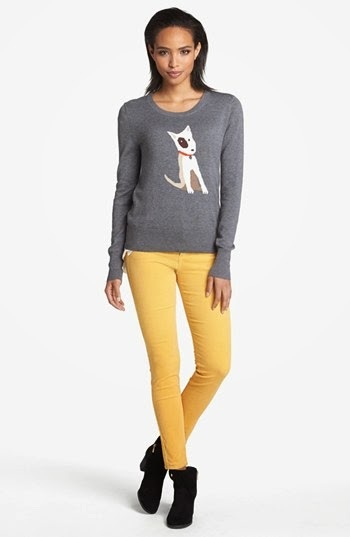 A great fall color and a great little graphic. 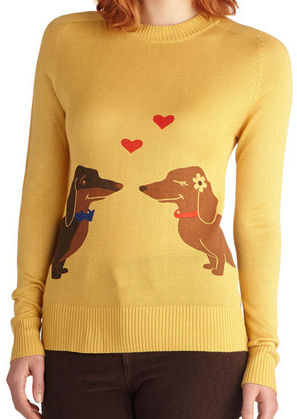 And their tails wrap around the back of the sweater to form a heart. I love this sweater. The subtle scoop neck and the dark heather gray is perfect for any color cord or just jeans. As I write this, Norman is as close to me as possible, no really, his paws are resting on the shift key. He says hello.